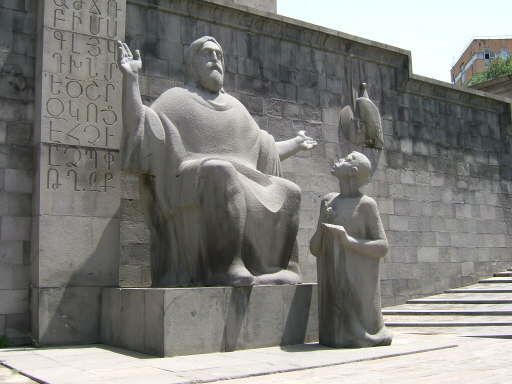 Saint Mesrop Mashtots was an Armenian monk, theologian and linguist. He is best known for having invented the Armenian alphabet, which was a fundamental step in strengthening the Armenian Church, the government of the Armenian Kingdom, and ultimately the bond between Armenians in the Armenian Kingdom, the Byzantine Empire, and the Persian Empire. Anxious that others should profit by his discovery, and encouraged by the patriarch and the king, Mesrop founded numerous schools in different parts of the country, in which the youth were taught the new alphabet. Mesrop's alphabet consisted of thirty-six letters; two more (long O and F) were added in the twelfth century. The invention of the alphabet in 405-406 was the beginning of Armenian literature, and proved a powerful factor in the up building of the national spirit. Saint Mesrop also produced a number of liturgical compositions. Some of the works attributed to him are: Megha Qez Ter, Voghormea indz Astvats, Ankanim Aadgi Qo, and Voghormea (Hymns of Repentance). Virtually every town in Armenia has a street named after Mashtots. In Yerevan, Mashtots street is one of the most important in the city center, which was previously known as prospect. Statue of Saint Mesrop Mashtots is situated in the Matenadaran Institute of Ancient Manuscripts in Yerevan. The original letters (i.e. only uppercase) in their original shapes can be seen at the stone.